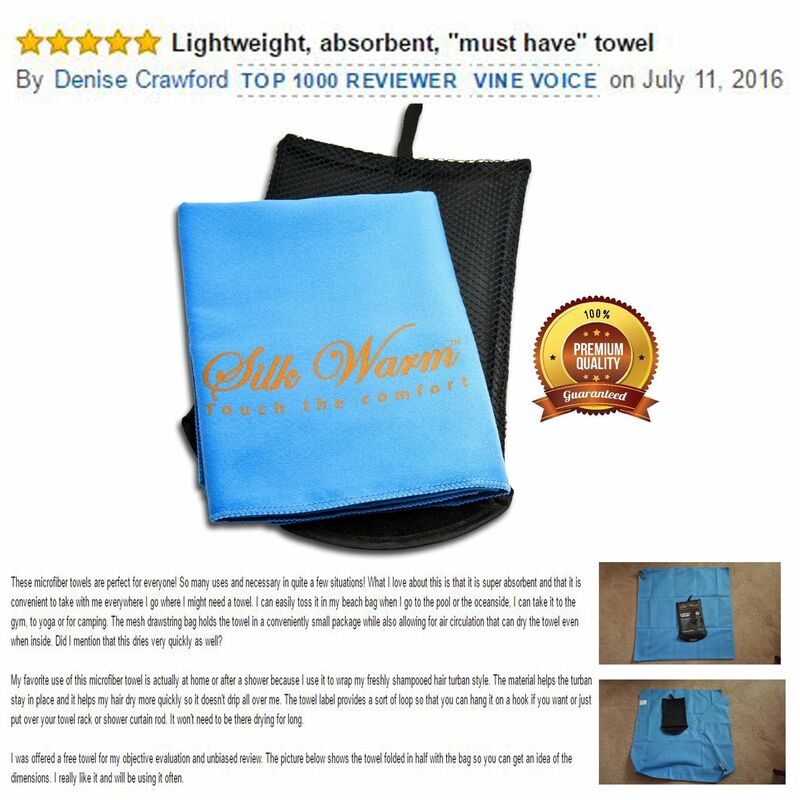 BAYSIDE, N.Y. - July 19, 2016 - PRLog -- "Lightweight" and "absorbent" are words used by Denise Crawford, part of the Top 1000 Reviewers of Amazon who currently ranks 563, to describe the premium Silk Warm Microfiber Towel which just recently, she had the opportunity to try for the first time. Her satisfaction seemed more apparent in her statement as she called the towel a "must have" item. Crawford further elaborated by saying "These microfiber towels are perfect for everyone! So many uses and necessary in quite a few situations! What I love about this is that it is super absorbent and that it is convenient to take with me everywhere I go where I might need a towel. I can easily toss it in my beach bag when I go to the pool or the oceanside, I can take it to the gym, to yoga or for camping." In addition, she specifically mentioned the mesh carry pouch to be useful as it holds the towel in a small package, allowing her to easily repack and bring it wherever she desires. It was called a "mesh drawstring bag" in her review and this comes automatically with each purchase. Aside from this, a free eBook entitled "How to Survive in the Wilderness" will also be sent immediately through email. Although more commonly referred to as a travel towel (https://www.amazon.com/gp/customer-reviews/R1ASEH7S089U2E/) due to its super compact and lightweight structure, Silk Warm promises many other uses. And for Denise, her favorite purpose of the towel was for home or for after showering. She explains "I use it to wrap my freshly shampooed hair turban style. The material helps the turban stay in place and it helps my hair dry more quickly so it doesn't drip all over me." The other key feature did not escape the reviewer's keen observations as she, in multiple occasions, brought up comments on the towel's quick drying capability. This, whereas compared to most cotton towels, the Silk Warm Microfiber Towel is noticeably 5 times faster in terms of drying. Along with her review are two photos she shared to give further details of the product. And this may all be seen and read through Silk Warm's product listing on Amazon.